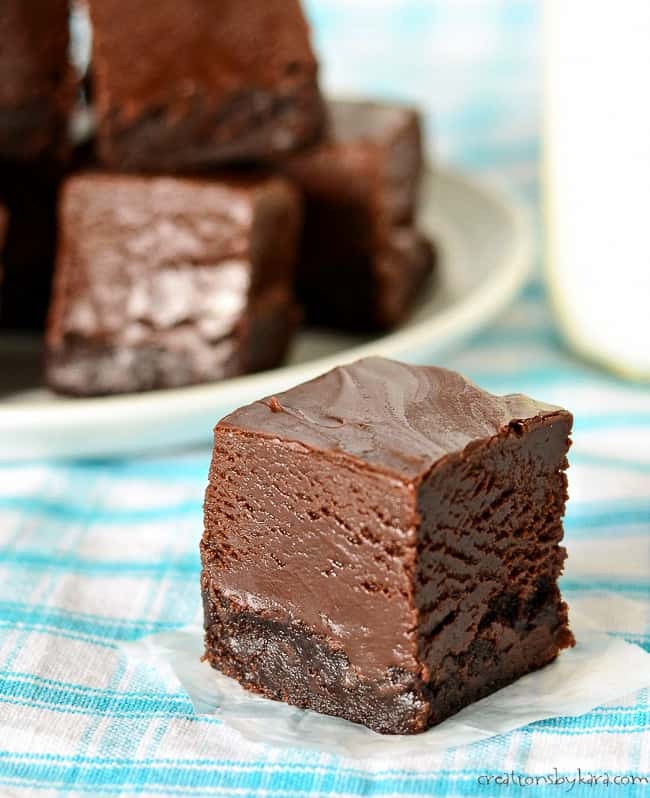 Nutella Fudge Brownies – chocolate brownies with a layer of silky smooth chocolate hazelnut fudge. A decadent treat for Nutella lovers! Brownies are one thing I can rarely pass up. Caramel Brownies and Peanut Butter Swirl Brownies are two more of my favorites. We are big Nutella fans at my house. My kids will spread it on just about anything, and we go through it so fast I swear they are eating it by the spoonful while I’m not looking. Not that I blame them. It is dangerously delicious! My favorite way to eat Nutella is on top of fresh strawberries. Aside from that, I mostly love baking with it. I saw a recipe for brownies topped with Nutella fudge at Love, Life, and Sugar and knew I had to give it a try. I used my favorite brownie recipe for the base, and omitted the chocolate layer at the top that Lindsay added. The two layers of chocolate were plenty for us. 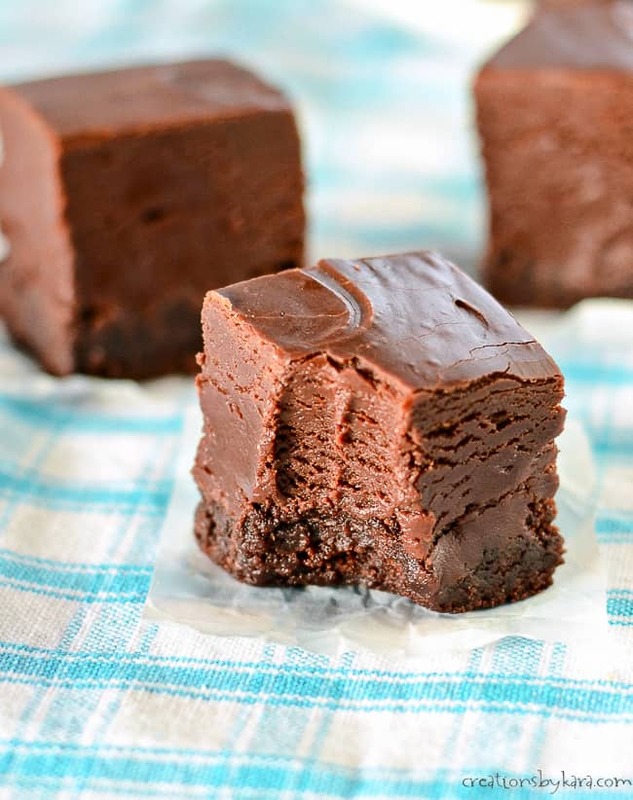 The brownies are dense and fudgy, and the topping is smooth and creamy. Every bite is pure decadence! The first time I made these brownies, I didn’t cook and stir the fudge layer long enough, and it wasn’t shiny. They still tasted great, but didn’t look as nice. So keep cooking and stirring till the fudge mixture is silky smooth and glossy. You’ll have a much prettier finished product. Melt butter in a large glass bowl in the microwave. Whisk in the sugar and cocoa. Add the eggs and vanilla and mix well. Stir in the flour and salt. Pour batter into a greased and foil lined 8″ pan and bake for about 25 minutes or until a toothpick comes out clean. Cool completely. For topping, combine all ingredients in a glass bowl. Microwave till smooth and shiny, stirring every 30 seconds. Spread fudge mixture evenly over brownies. Let sit for several hours or till set. Use foil to remove brownies from pan. Cut into squares and serve. Store leftovers in an airtight container. 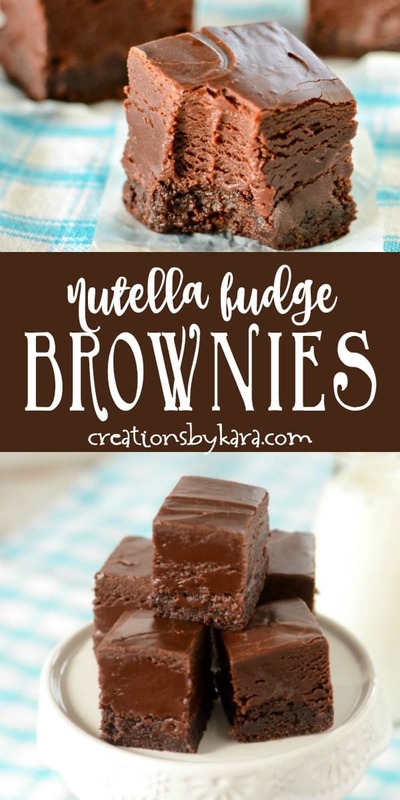 -I used one of my favorite brownie recipes for the base, but you can use a brownie mix if you prefer. Just make sure you bake it in an eight inch pan. -As you are cooking the fudge, it will melt but still be separated. Continue to cook and stir, and when it is smooth and glossy, it is ready! -I used foil to line my pan, but parchment paper will also work. -These brownies are pretty rich, so I like to cut them into smaller squares. They will keep for several days at room temperature in an airtight container. If you need to store them longer, you can wrap them well and store them in the freezer. I like to put them in a layer of plastic wrap, then in ziplock bags. 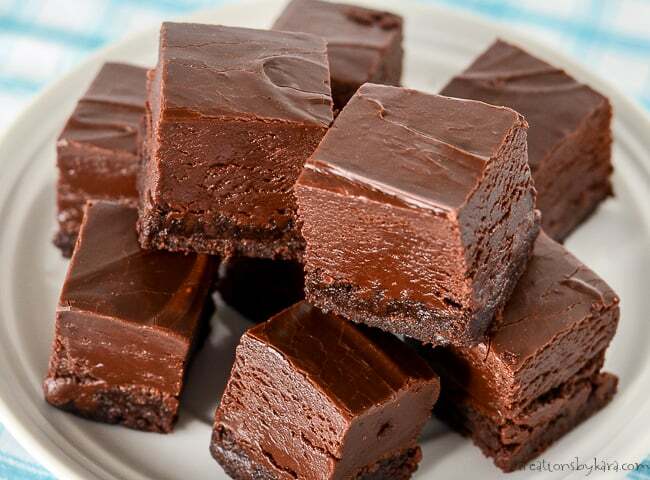 Chewy chocolate brownies with a layer of silky smooth chocolate hazelnut fudge. Line a square 8" pan with foil, then spray with non-stick spray. Preheat oven to 350°. 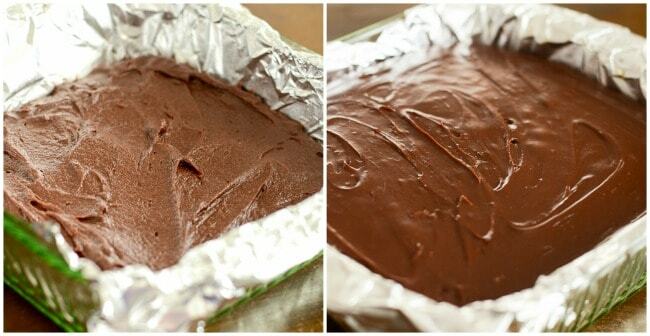 Spread fudge mixture evenly over brownies. Let sit for several hours or till set. 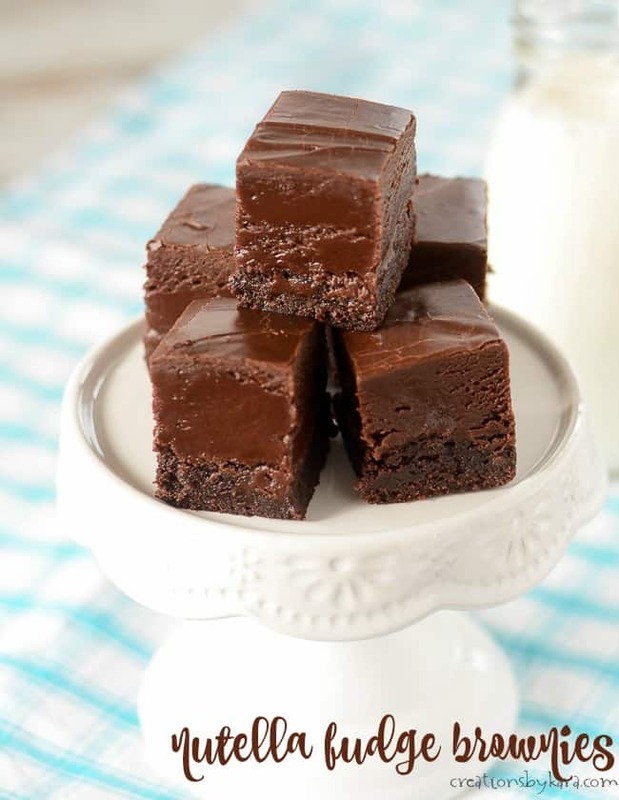 To see all my brownie recipes, click HERE.